Lately I've become obsessed with a lot of French sewing bloggers/Instagrammers and French-speaking sewing pattern companies. Obvs, all French-speaking sewers and pattern companies aren't one amorphous entity, and every sewer and sewing pattern company has their own unique blend of style elements and influences. But that said, I'd say that there are some styles, silhouettes, details, colours and fabrics which I've noticed regularly cropping up in the output of a number of French-speaking sewers and pattern companies, and these are MASSIVELY floating my stylistic boat at the moment. 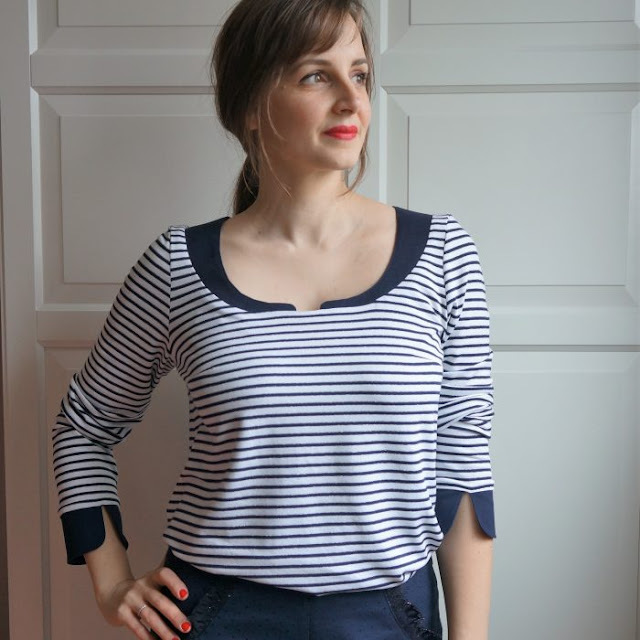 I'm hoping to absorb some of these elements into my own sewing and wardrobe, and in this post I want to record my favourites from the French-speaking pattern companies I've had a chance to check out so far. If you are a fan of any others I haven't mentioned, please leave a comment so we can go and take a look. The Aime Comme Marie site seems to be a magazine and a lifestyle blog, as well as the producers of sewing and knitting patterns patterns for women, children, men and the home. Phew. I *think* some/most styles are available in both formats. From what I can tell, yes. Apologies if I am incorrect. This company first drew grabbed my attention with their ruffle-sporting Magellan and Macaroni styles (the latter is pictured above). However, after further research, I now think the Malice dress pattern is the best of the bunch. This pattern company's style is exactly what I'm talking about: sweet, simple, timeless, wearable, subtly quirky, and loads of other adjectives that I can only hope will one day be applicable to my own style. The Blouse Paule (pictured above) is an interesting, unique take on a casual knit top, but it's the Blouse Ortense that has really captured my heart (pictured at the top of this post). This collection of patterns neatly straddles the line between vintage/retro and modern in style. Impressive. Almost all the range is available in both formats, however there are a few that are PDF only. Honestly, I don't know. However, the fact that it isn't mentioned, makes me think the patterns are probably French only. Probs worth emailing if French instructions are a deal breaker for you. The Bergen cardigan pattern looks a great layer for autumn/winter/spring, and jacket-alternative for summer. However, the stunning scalloped hem of the Cezembre blouse pattern (pictured above) is the one mostly likely to soak up some of my money. 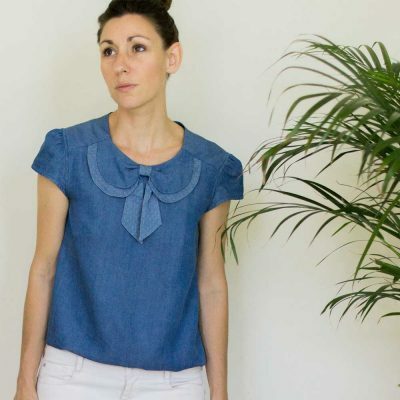 If you're into beautiful yet simple, A-line blouses with subtle details, then Atelier Scammit are may well become your favourite sewing pattern company. They do offer a few other styles of pattern, but that type of blouse is clearly their bread and butter. I adore most of their patterns, but the Artesane (pictured above), which is so beautiful from the front AND the back, might just be my fave. Actually this company is Italian, but their site is in Italian, English AND French. Clever peops and cute designs. I'm assuming that the patterns themselves are in Italian, French and English, but please check before you buy as I can't see it written explicitly anywhere. I'm enjoying the Dharma dress pattern (pictured above) for its spin on the traditional fitted-bodice-and-gathered-skirt dress style, but it's the Jolanda blouse pattern that I'm closest to buying. Deer and Doe are probably the best known French-speaking pattern company in the UK (if not the wider English-speaking sewing community). They definitely seemed like the first indie French-speaking pattern company to get their patterns translated into English, and then stocked in UK craft shops. All are available in both formats. No! Both French and English! 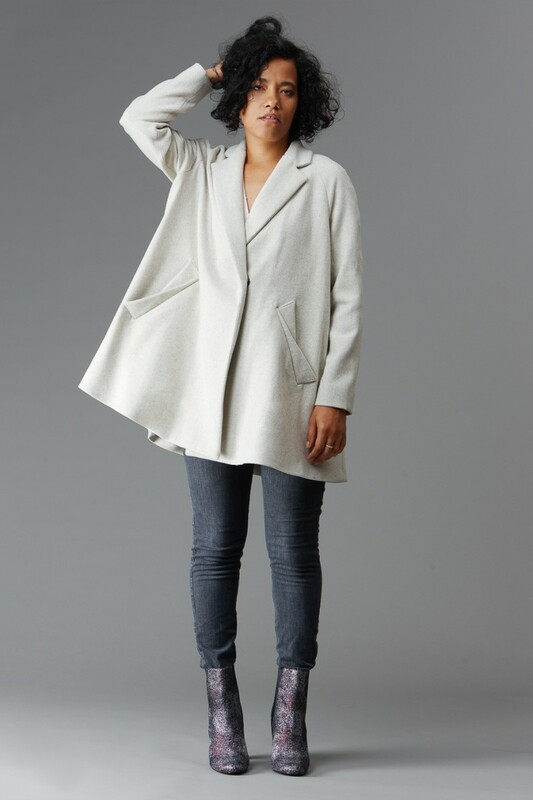 I've owned the Chataigne shorts pattern for years, and I *will* get round to making next summer, however the new Opium coat pattern (pictured above) took my breath away when I saw it. 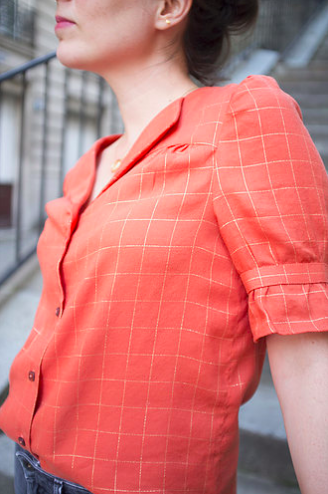 This French-speaking pattern company/epic-one-woman-band is based in Belgium, not France. And thanks to the relentless prodding of my much-suffering husband (who has a decent grasp of French, especially when he's armed with a translation app!) into translating a lot of her blog posts, I've found out that she's really funny. But back to the patterns. Her shop and the patterns themselves are a bit more lo fi than many (for example, her instructions come in the form of a word document with no step-by-step images or illustrations). But the patterns are all (IMO) very wearable with beautiful proportions and clever details. (You can see my version of the La Trop Facile jacket here, and the La Brune blouse here and more successfully here.) 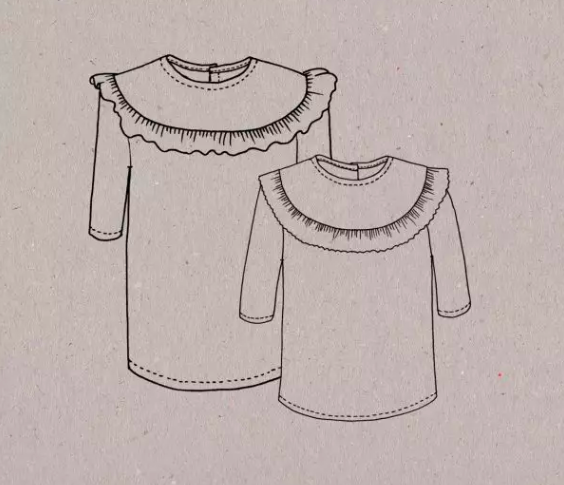 Plus, some adorable children's versions of many of her women's patterns are also available. I've had my eye on many, but I keep coming back to the Flamenco and Japon patterns (the latter is pictured above). 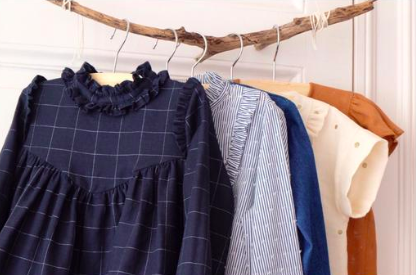 Until recently, this sewing pattern company only produced children's styles. However, they have recently started to produce a selection of their patterns in women's sizes too. 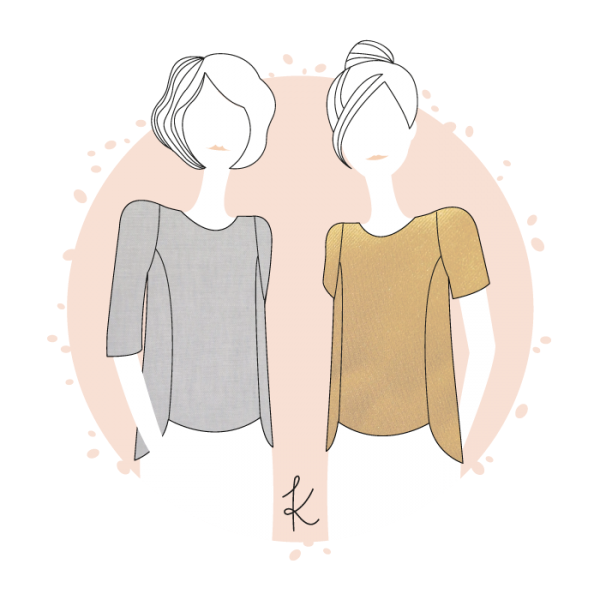 You should also know that they very generously offer a free PDF sewing pattern of your choice from a small selection in exchange from signing up to their newsletter. Don't quote me on this, but all their children's patterns seem to be available in both paper and PDF, and the women's patterns only in PDF at this point in time. No! Both! Woo hoo for me! 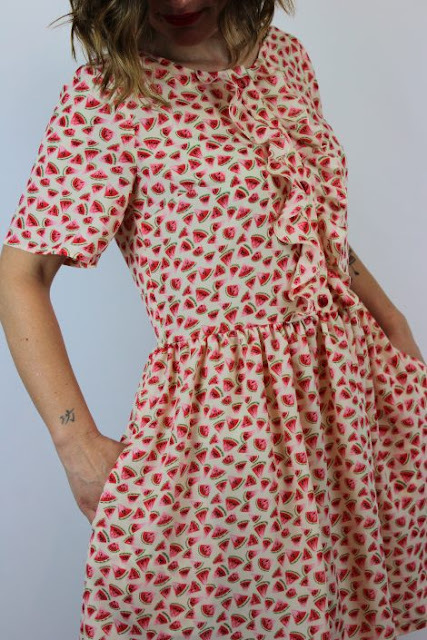 As I mentioned above, some of their styles are being turned into women's versions which I am thrilled about because I am OBSESSED with their two most recent releases, the Ida and Louise, both of which are the fruits of a collaboration with an amazing sewer Fanny (@petites_choses__). I've also had a lot of fun so far sewing the Corfou dress and Avana trousers for my little girl. 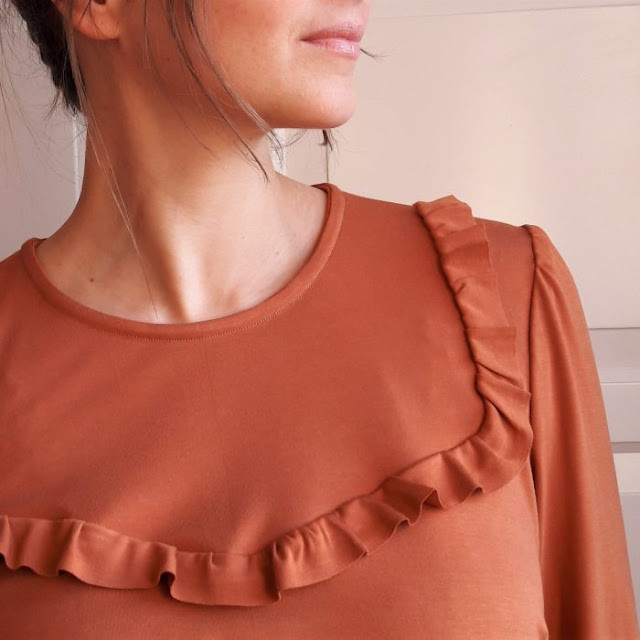 This sweet little company offers a handful of patterns, but currently for me it's really all about the Blouse Leonie and it's expansion pack of wonderful style options. The Blouse Leonie (pictured above) the most perfect collar design in the world, and everyone else can go home. RdC have got a massive range of interesting, edgy-but-very-wearable women's pattern styles. Plus, if you believe that twinning(with your child) is winning, you should know that seven of their styles are available for children. Nope. A few months after it's French release, each pattern is available translated into English. From what I can tell, Slow Sunday Paris is only a couple of years old, but their whole vibe looks so lovely and they have a great range of patterns already. Both, but surprisingly most of them seem to be available in paper format only. Despite the fact that some parts of their website is written in both French and English, it seems as though the patterns are French only. That said, from the PDF I've bought, the instructions look super clear with great illustrations for each step. So if you don't speak French but are armed with a translation app, you'll probably be fine. 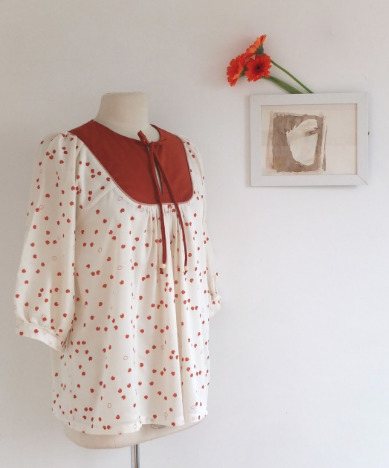 I just bought the Dorothie blouse pattern (pictured above) because A) I'm a sucker for a sweet little blouse pattern, and B) that sleeve. And if you haven't checked out the back of the Lila top pattern, then make sure you're sitting down because it's amazing. Thank you Zoe — this is a terrific intro to some pattern companies I was not familiar with. What style!! I too am sorely tempted to try some of these lovely blouses. The thought of trying a pattern with French instructions made me laugh. I’m lucky to get through the English ones! Despite living in France, out of all these I've only used Deer and Doe patterns which are great and, like you, I'm in love with that coat. Very tempted. I don't share your liking for ruffles on blouses (too old!) but I have already bookmarked the Dorothea from Slow Sunday Paris, the Paule from Anna Rose and the Leonie from Mimoi. Another French pattern company which definitely 'does' English is I Am Patterns. I'm vaguely intrigued by their poncho pattern - although, to date, I've never worn such a thing in my life. Such a helpful post, thank you! A few I'm familiar with and have sewn from, but a few are new to me. I pretty much want to purchase every pattern from Aime Comme Marie and Anna Rose. This is such a great post! I just had to purchase 2 patterns from Anna Rose Patterns. This has brought on a question though - is there a pattern review site for French companies? I was just looking on Pattern Review and Kollabora, but I couldn't find Anna Rose anywhere. Is there another place that French sewists post about their makes? Thanks so much - I may no be addicted, lol. Thank you Zoe for this great post. You forgot my favorite french pattern company: Pauline Alice patterns. It was the first french company to offer patterns in english (and also spanish as Pauline is actually living in Spain). Patterns are print and pdf but older models are not reprinted and become pdf it seems. Another great company is Ivanne S. Her patterns are in french only I think and are pdf only. She makes women and children patterns and each pattern is packed full of different options. Also the explanations are extremely detailed. Another one is Chez Machine. It's mostly print but some patterns are also pdf. I don't know if it's translated in english. Thank you everyone for your comments! Thanks especially to Sabine for answering Megan's question. I had heard of the Thread and Needles site but had forgotten it's name. Thanks again everyone! Happy French sewing..